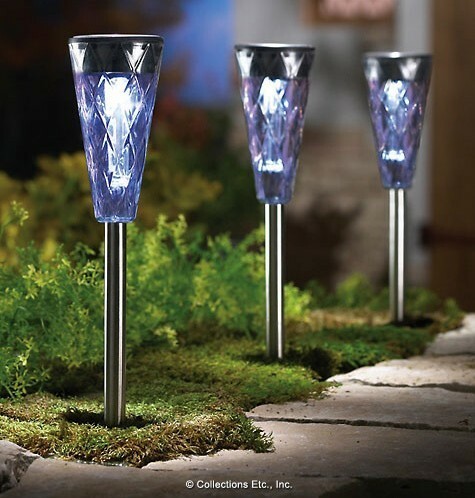 Solar lights can be widely used in lawn ornament decoration, squares, parks and other occasions, which belongs to the field of lighting technology. Its main use of shade connection bottom bracket, solar panels placed on the battery compartment built into the lamp, battery box mounted on the bottom bracket, the light emitting diode mounted on the battery panel, solar panels using wires rechargeable battery and control circuit. Structural integrity of the utility model is simple, compact and reasonable; no external power cord, easy installation, beautiful appearance; As a result of light-emitting diodes placed in the bottom bracket, rear lamp emitting whole body are illuminated, light feeling better; All electrical components built, with good usability. Including serpentine lights, plate lights, solar neon lights and other massage. In practice, of course, solar outdoor lighting a little more complicated. In addition to high-capacity batteries and solar panels, the system also includes advanced dedicated monitor, and when you stop working lighting, solar power battery starts charging, and then re-charged, you get more power. The key is the sun outdoor lighting, solar photovoltaic house mounted solar panels, has a dedicated microprocessor control system and the battery. It is connected to specially designed with extra load light reflectivity and high energy ballasts. High brightness, easy installation, reliable, not the laying of cables, no conventional energy consumption, long life and other advantages. High brightness LED light-emitting diode design, without manual operation, automatic lights dark lighting, dawn automatically extinguished. Product strong fashion sense, texture and beautiful, fine, with a modern, mainly used in decorative lighting residential green belt, green belt of industrial parks, scenic spots, parks, gardens, squares and green spaces and other places.